The U.S. Justice Department is suing to block the acquisition of Dallas-based Waste Control Specialists, which wants to expand the nuclear waste dump it operates in West Texas. The U.S. Justice Department is suing to block a Salt Lake City-based company’s acquisition of Waste Control Specialists, the Dallas-based company that wants to expand the nuclear waste dump it operates in West Texas. If the $367 million merger with proposed buyer EnergySolutions goes through, it would "combine the two most significant competitors for the disposal of low level radioactive waste (LLRW) available to commercial customers in 36 states, the District of Columbia and Puerto Rico," the Justice Department said in a statement announcing the civil antitrust lawsuit. That merger would "deny commercial generators of LLRW – from universities and hospitals working on life-saving treatments to nuclear facilities producing 20 percent of the electricity in the United States – the benefits of vigorous competition that has led to significantly lower prices, better service and innovation in recent years." "Since opening its LLRW disposal facility in 2012, Waste Control Specialists has provided EnergySolutions the only real competition it has ever faced," Assistant Attorney General Renata Hesse in the statement, which noted that "billions of dollars are set to be awarded in the coming years." EnergySolutions said it would "vigorously defend" the pending acquisition, noting in a statement that "there are numerous disposal sites for LLRW waste operated by the competitors of the two companies." A spokesman for Waste Control Specialists did not respond to an emailed request for comment. The commission has requested additional information from the company in June that it has yet to provide. But the commission is still moving forward with its review and is seeking public comment on how the project could impact the environment, including endangered species, significant cultural resources and sensitive areas, along with increases in traffic and noise and dust from construction. "We cannot proceed with the technical safety review until WCS adequately addresses our request for supplemental information, but we do have the information we need to begin the environmental scoping process now," said Mark Lombard, who heads the commission’s division of spent fuel management, in a statement this week. "WCS will bear the cost of staff time devoted to the environmental review, even if we are unable to docket the application in its current form." Written comments can be submitted at www.regulations.gov; via email to WCS_CISF_EIS@nrc.gov; or by mail to Cindy Bladey, Office of Administration, Mail Stop: OWFN- 12 H08, U.S. Nuclear Regulatory Commission, Washington, DC 20555-0001. Anti-nuclear groups seize on missing information in license application from Waste Control Specialists, which says it’s normal to add information to a complex, voluminous application. 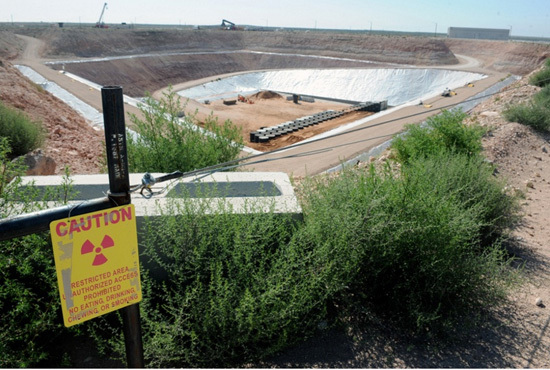 The company operating a low-level nuclear waste dump in West Texas applied for a license to begin accepting highly radioactive spent nuclear fuel.